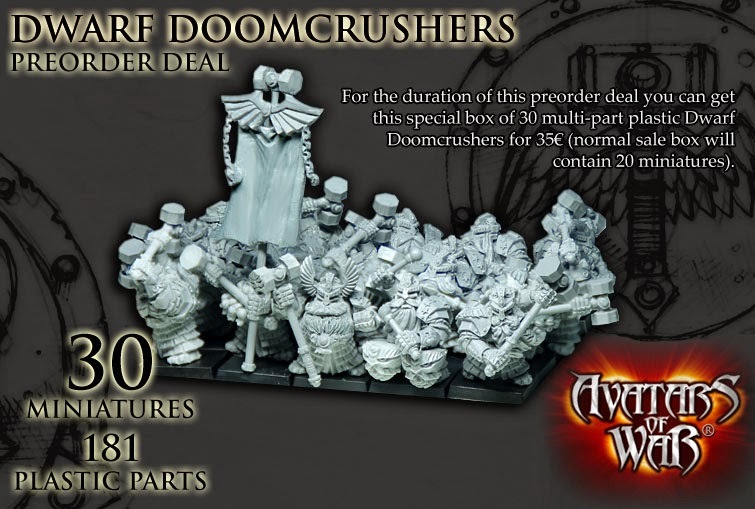 There has been much dwarven muttering and grumbling while we waited, but finally the long anticipated dwarf doomcrushers are available to pre-order. There are more details and pictures on the AOW site. I like the look of them, they will fit in with my dwarf army far better than the new GW sculpts. At about one third the price if you take this introductory offer, I can imagine I am not the only dwarf player interested. ......obviously the remedy is to go look for even more projects. I spotted this thread on the dakka dakka forum, about an upcoming kickstarter for fantasy miniatures and rules. More minis, more rules, perfect! 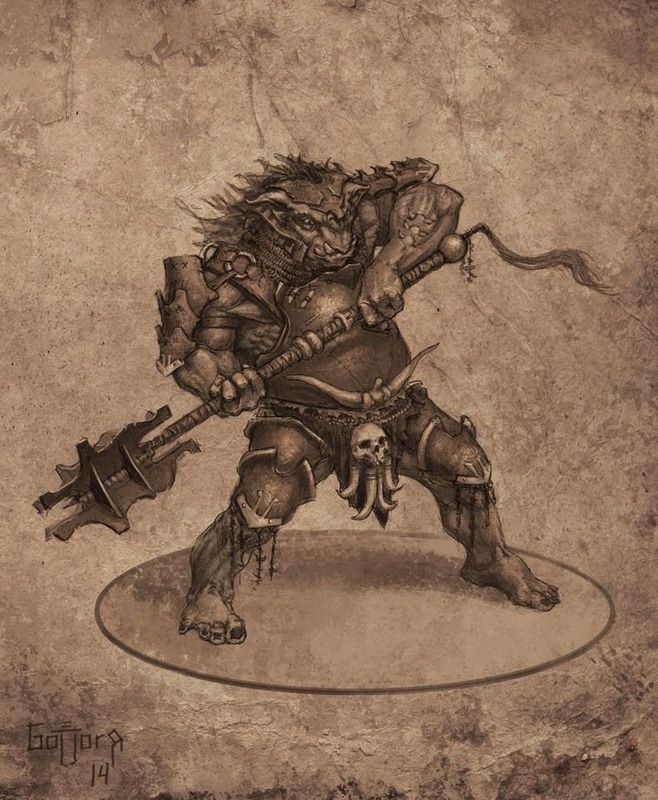 Minion Miniatures are a new company hoping to make 28mm fantasy miniatures - there's plenty of information on their facebook page. At the moment there are just concept sketches to view. There are so many companies about that produce fantasy figures, what's so special about these guys? It's a personal taste thing, but these strike me as a little bit different, slightly more original than many of the clones around. The thing that really caught my attention was their intention to produce some of the range in hard plastics, using Renedra, the company who used to produce for Games Workshop and now do so for Perry Miniatures. 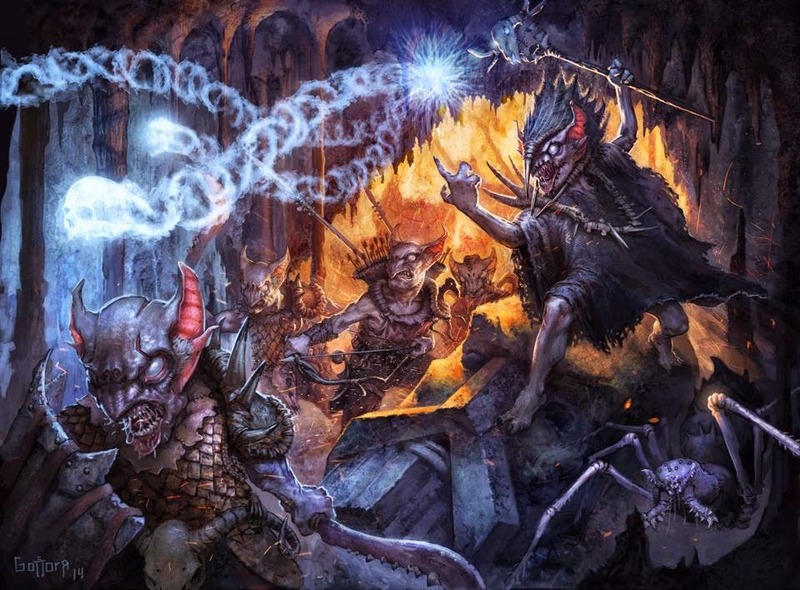 Another bonus for me is that they are developing a set of fantasy skirmish rules. Why is that a big deal? Well, you try naming decent rulesets for fantasy small battles, say about 30 or 40 figures a side. It's surprising but it seems to be a niche that nobody is filling. An appealing aesthetic, a proven manufacturer and a set of rules that will be available to download before the kickstarter are three great plus points. I am really looking forward to more information and am impatiently waiting for pictures of the sculpts. We all know that concept art is not necessarily an indication of the quality of the product, so must wait for more sneak peeks and the launch of the project, potentially in a couple of months. If you like the concepts, check out the facebook page or dakka thread for much more information. 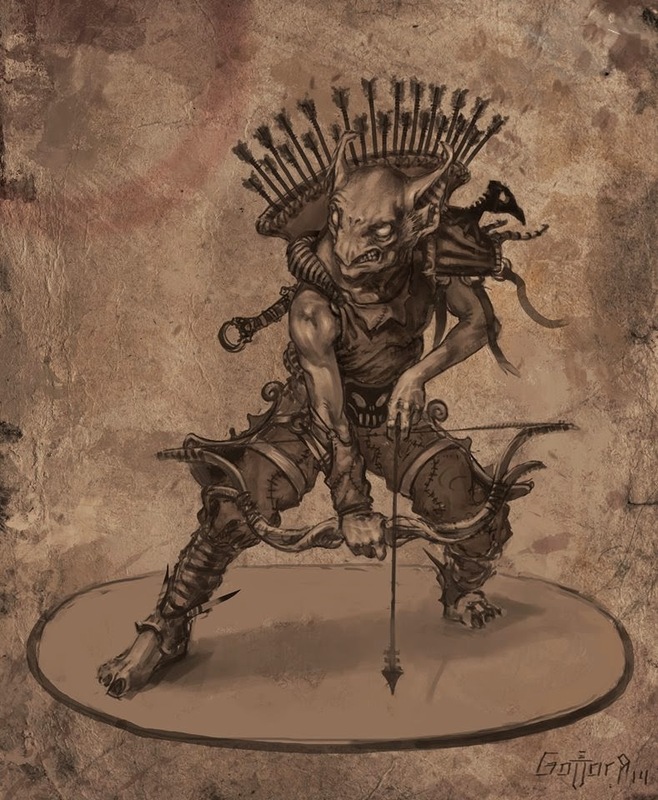 Minion Miniatures are actively asking for customer feedback of their design stages, so if you have some brilliant idea for the next big thing in fantasy gaming, let them know. 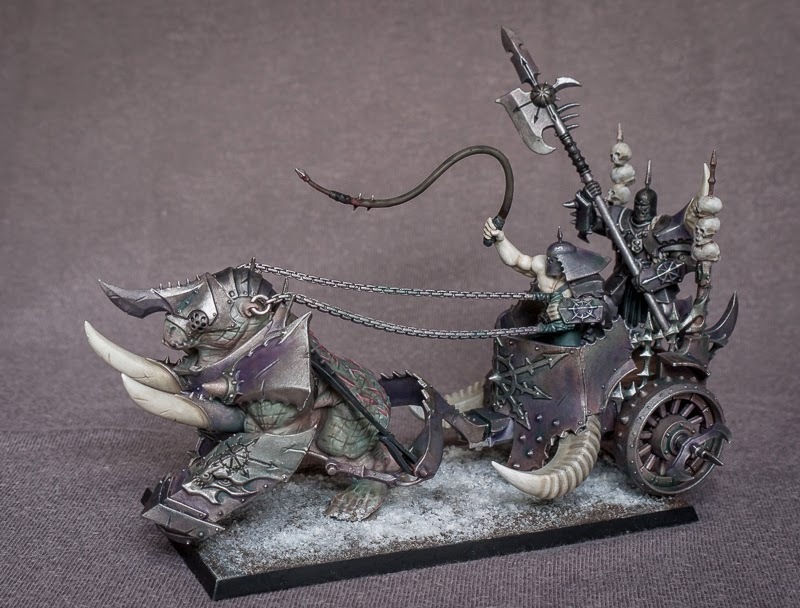 The chaos army continues to grow with this gorebeast chariot the latest addition. I have to admit that when this model was originally released I was a little uncertain about it. 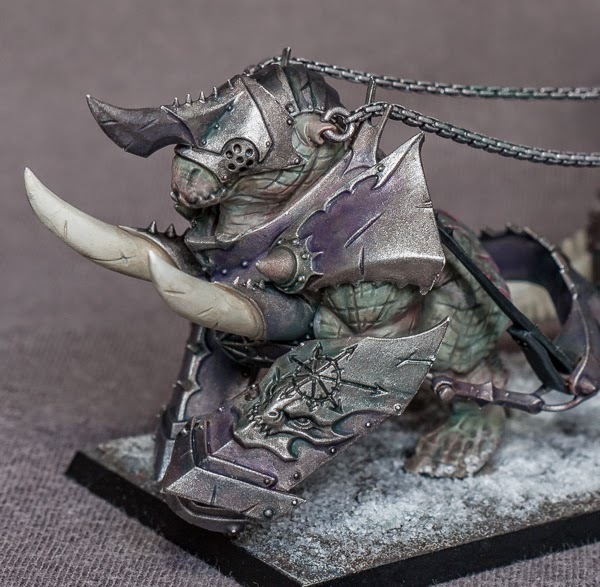 Like so many of the newer kits it seemed a bit over the top for my tastes, not in the same WTF-league as the war shrine or the slaughterbeast, but still a bit "too spiky". If I'm really honest I thought the gorebeast looked a bit goofy too. As I wasn't playing Warhammer at the time it was very easy to shrug my shoulders and pass it by. However, now that I am back into the game, I was keen to give my chaos army a boost with some non-infantry units since that's all I ever seem to paint. I looked around at all the options and decided to take a punt on the chariot kit. I am so glad I did. As usual, the kit is a wonder of engineering and design. All the pieces slot together easily and with little need for instruction (though once or twice I think a little hint on the sequencing of multi part assembly would not go amiss). The chains and straps securing the beast to the chariot require a little care, but it all fits with no real problems. I kept the optional bits to a minimum, there's plenty of detail on the kit without extra flags, chains, capes and the like. I also trimmed down the trophy poles so that the height of the models is constrained. My number one pet hate on the wargaming table is overly tall or awkward sticking out bits, just asking to be snagged, knocked or snapped. Painting wise I kept it simple. I started by washing the armour in greens and browns, but then decided to add some purple for a change and it developed organically from there. I originally wanted it to look as thought it could be marked by either of Slaanesh or Nurgle, but in the end decided this was too disparate and went for the Dark Prince. Once I had settled on the purple of the metals, the green of the beast was a natural contrast. The armour of the crew is a mix of the purple tinted silver plus some black and grey plates, though they don't show very well in the pictures. 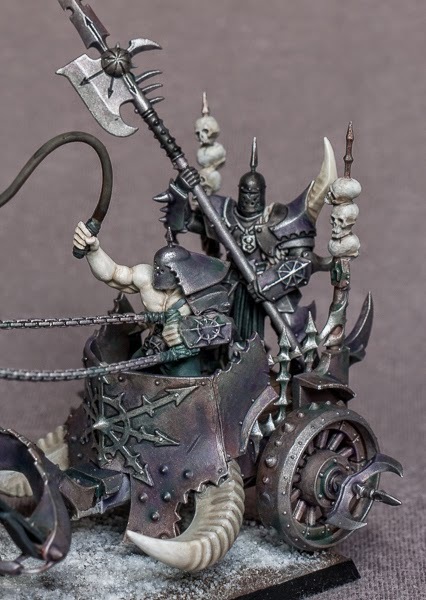 The warrior is not glued in place; theoretically I can use the chariot as the mount for a character and I have often wondered about a sorceror on wheels. I might give it a whirl some time. The unused parts will go to another chariot - one of the reasons the kit attracted me was the fact that I could use the horses on an old metal chariot body. It's not quite two for the price of one, but they are a nice bonus. Even nicer is the number of extra warrior heads in the kit - a choice of two for the charioteer and six for the chaos warrior. One has ridiculously large horns and will possibly never be used, but the other four spare heads are a very welcome addition to my pile of bare heads for my next warrior regiment. 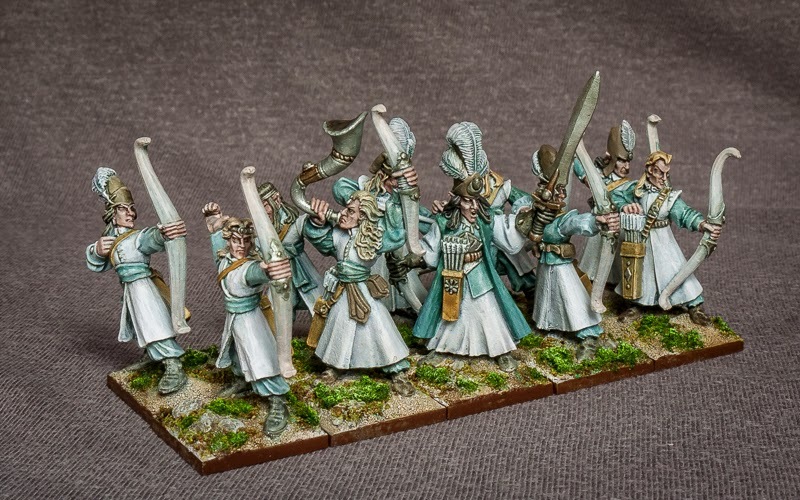 The first unit for my new High Elf army! I am really pleased with the way it worked out. High Elves are probably the most finely detailed of figures to paint, all those intricacies can mean you never seem to get them finished. So I was pretty happy to get them to this stage in a reasonable time. They are the most time consuming of my armies to paint, offset to a degree by their smaller numbers. There are parts on these models that I could do more with. The gems are not painted, I am treating them as ornate metal work - I will probably add gems just to the characters. The robes are pure white, no decorations, again something that may change on heroes and mages. There are plenty of other areas that could get more attention, but I am happy with this standard and want to press on. Next on my list of things to paint is Lothern Sea Guard, but these present a fresh (and scary) challenge of freehand shields and banner, so I might take a safer route and switch to glade riders. I have a few weeks to decide as I will be alternating between this and my chaos army, continually sweating over all these tiny details would drive me over the edge. Big, simple chaos for a while, then back to the delicate ones, that's my short term plan.